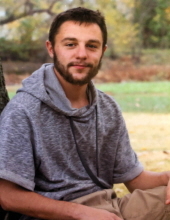 Tyler James Land, Webb City, passed away Saturday April 28, 2018 from a drug overdose. He spent April 25th, his 21st birthday, on a ventilator with the great staff at Mercy 3rd floor ICU trying to save his life. Tyler was a healthy, beautiful, fun, caring young man who loved life. We do not believe he ever imagined his poor choice would result in death, breaking the hearts of those who love him. Tyler graduated from Webb City High School in 2016. During his school years he was active in soccer and his church. He liked all activities involving water, especially fishing. He was a true animal lover. He was a born again Christian, which gives us peace knowing life’s struggles are over. Tyler is survived by his parents, Chuck and Lisa Land of Webb City; brother, Zac (Anna) Land of Rogers, AR; sisters, Ashley Land and Darci Land of Webb City; grandmother, Fronsie (Bill) Compton of Joplin; aunts, Brenda (Doug) Overman of Welch, OK, Teresa (Steve) Webber of Oologah, OK and Denisa (Lance) Simpson of Webb City; his uncle, Joe (Tami) Hughes Stockton MO and his nephew, Grayson Land, along with a host of cousins and friends. Tyler wanted to donate his organs so others may live. Services will be held Tuesday, May 1st at Carterville Christian Church at 6:00 PM. The family will receive friends from 4:00 PM until time of service. In honor of Tyler and at the request of his family, no flowers please, just do something kind for someone. "He will wipe away every tear from their eyes, and death shall be no more, neither shall there be mourning, nor crying, nor pain anymore, for the former things have passed away." Revelation 21:4. Please visit www.simpsonfh.com for online condolences. Arrangements are under the care of Simpson Funeral Home of Webb City. To send flowers or a remembrance gift to the family of Tyler James Land, please visit our Tribute Store. "Email Address" would like to share the life celebration of Tyler James Land. Click on the "link" to go to share a favorite memory or leave a condolence message for the family.